Data is at the heart of the conversation for organizations today. Organizations are data-hungry and data-driven. It is, after-all, the information age! And organizations that can master, unlock, understand, and leverage their data to enable themselves, their employees, and their products are on a paved road to success. For these organizations, Analytics is the key – particularly Embedded Analytics. Firms have always amassed data. Even in their most archaic forms, they have collected and hoarded it. The boom of social media has added messy, real-world datasets to the already burgeoning mound. A decade or so of this activity has helped stretch these mounds into ever-rising mountains of data. Treading and navigating these mountains is a difficult task. The information flow is not transparent, partly due to unclear data-architectures of organizations. Data is siloed, incomplete, unstructured and inaccessible. Data is fragmented and spread thin across pockets. And, data is unverifiable and unreliable. For an organization trying to tie all its data-points together to create a cohesive storyline, data needs the aid of analytics – for sifting through numbers to accurately forecast the future, for reporting, predicting and prescribing pathways, for garnering insights, and for unraveling the stories and patterns entrenched within numbers. Business Intelligence and analytics was born of the need for organizations to decrypt what their data was telling them. Self-service BI took the floor and captured everyone’s attention. This was the time when every organization was undergoing transformation and an analytics enablement journey. IT departments were taking up complex (and often expensive) data-warehouse integrations and BI deployments. Everyone was on the pathway to realizing that single view of solving business problems. These behemoths of BI tools were soon handed over to untrained employees. While the promise of analytics remained – to enable users to make informed decisions regardless of their technical orientation, qualification or skillset, in truth, analytics required tremendous handholding. Dashboards and reports too just showed a snapshot of data frozen in time rather than explore real-world data. And BI applications with their separate interfaces forced users to leave the comfort of their known applications and toggle between screens, views, and dashboards in order to derive insights. Of course, enabling people was and is paramount. But separate analytics was perhaps not the right fit. In fact, the solution that resonates with the users is tightly integrated into the systems they use. Bringing in additional context, awareness, and analytical capability to the very specific tasks they perform. Embedded Analytics, or analytics capabilities bundled into business applications, are making a dramatic foray. Bringing the distinctly traditional – exploratory data analysis and visualization on-the-go capabilities, to core applications such as CRM, HRMS, ERP, and SCM, to name a few. And the demand is voracious, increasingly from sales personnel, recruiters, HR managers, logistics managers, suppliers, inventory keepers, medical representatives, and such. The need is for timely, visual, and interactive access to the data they work with within the respective business units. And the expectation is for analytics to be seamlessly integrated into the core application suites. Generally, these integrated analytics capabilities are not developed in-house (although they can be). Instead, BI vendors such Sisense develop them for the business application vendors, who then package the analytics into the product. Hence the name Embedded Analytics. It is clear that Embedded Analytics can bring a number of benefits to an organization, from a reduced total cost of ownership compared to conventional BI deployments, to making your end product robust and usable. Embedded reports and dashboards within an existing application can make it highly user-friendly. And give it a competitive advantage. The offering meets the needs of your customers, who embrace it seamlessly. AI is augmenting Embedded BI to analyze enterprise-wide data. Machine Learning is enabling quicker and more efficient mining, management and analysis of data. Coupled with Deep Learning, companies are building the capability to analyze more complex, rich, and varied data, as well as handle a greater volume of data. The use of Natural Language Processing makes details even more coherent. Social media commentary is readable; videos, picture and images are interpretable; and sentiment is comprehensible. Suddenly, the mountains of data that we talked about earlier become easily surmountable. All this within the context of your data, integrated within familiar applications, streamlining your every-day tasks. 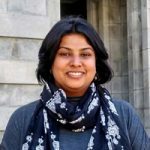 Lakshmi writes about the future of technology including Business Intelligence, Machine Learning, Artificial Intelligence, Blockchain, Cloud, CyberSec, and more. She is an engineer and techie, with years of experience working with the best in the field.